Posted on October 31, 2012 by Susan H.
This will be the first Hallowe’en that both my boys will not be ‘trick or treating’ in the neighbourhood. It is a bittersweet moment…on the one hand, I feel relieved that there will not be any peanut/tree nut candies and chocolate bars to worry about passing through our door yet on the other hand, I will miss the anticipation and excitement of the boys getting all dressed up and preparing to head out for a fun filled night of ‘trick or treating’ with their neighbourhood friends. With both the boys in highschool…the teenage years is my new ‘norm’. My little boys are growing into young men. Michael, my eldest at 16, has not been ‘trick or treating’ for quite a few years now. He enjoys answering the door and handing out all the candy to kids. This year, both Michael and Matthew will herald the door…I must say, I like to get in on the action too! Seeing the little kids all dressed up is my favourite…especially the neighbourhood kids! Last year, I put on a Hallowe’en party for the boys’ neighbourhood friends. Click here to view. This year, the boys did not seem as interested. One is never too old for treats…so I will be surprising my boys with some special Hallowe’en treats. Dairy, Egg, Soy and Peanut/Tree Nut Free Gingerbread Ghosts, Bats and Cats, black licorice, Yummy Earth candy drops and small packages of Yummy Earth Gummy Bears. I adapted this cute Zebra Cake from a Robin Hood Flour advertisement in one of those little booklets of recipes and coupons. 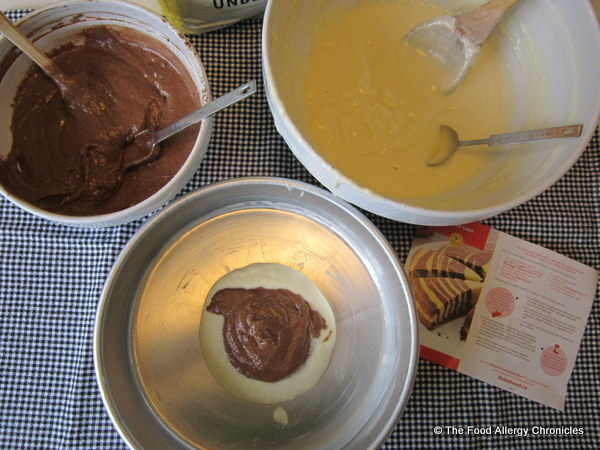 Kids will really enjoy the preparation of this cake…scooping the vanilla and chocolate batter in to the cake pan is the perfect task for ‘little helpers’. 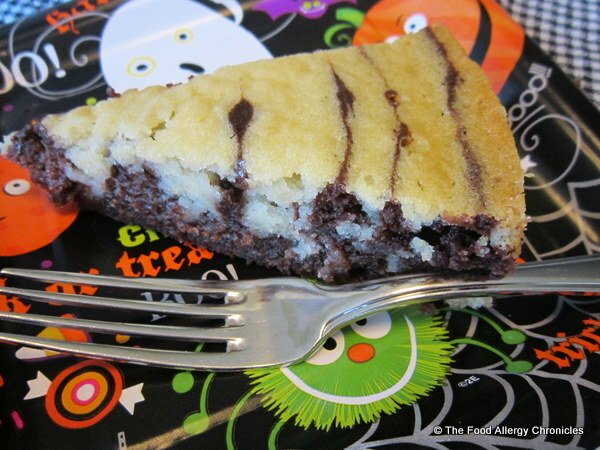 I think this is the perfect cake to celebrate Hallowe’en…a cake disguised as a zebra! Tip: I baked the cake for 40 minutes…next time, I would bake it a bit longer as the centre of the cake was a little undercooked…Matthew didn’t mind but Michael found it ‘too soft’. P.S. 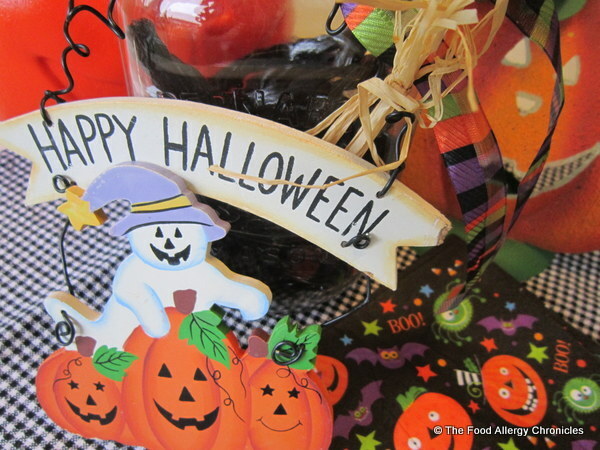 How do you navigate Hallowe’en with your children’s food allergies? Click here for my chronicles on our journey with Hallowe’en. P.P.S. My thoughts and prayers go out to all those struggling in the aftermath of Hurricane Sandy. 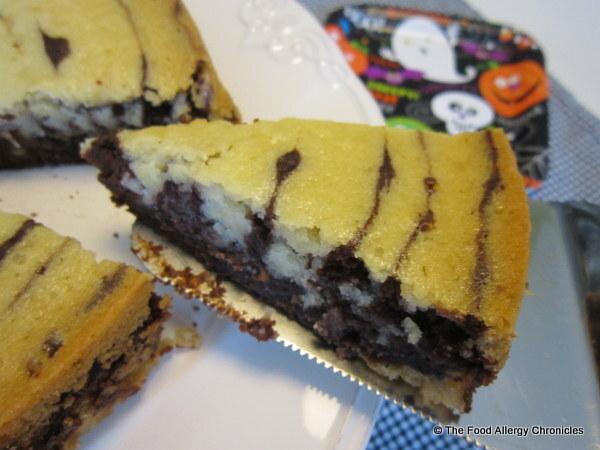 This entry was posted in baking, cakes, cookies, dairy free, dessert, egg free, Hallowe'en, multiple food allergies, peanut/tree nut free, soy free and tagged Dairy Egg Soy and Peanut/Tree Nut Free Gingerbread Ghosts Bats and Cats, Dairy Egg Soy and Peanut/Tree Nut Free Zebra Cake, Earth Balance Soy Free Buttery Spread, earth balance vegan sticks, Natura Enriched Rice Beverage, Yummy Earth Candy Drops, Yummy Earth Gummy Worms by Susan H.. Bookmark the permalink. Natasha, beside me right now, commented “That looks SO GOOD! We have to make that!”. Definitely a Halloween Hit! Unfortunately, we do have trick-or-treaters still living in this house…so there will be too many treats around for the next little while. I will have to save the cake for another occassion. Alex asked the other day about your Halloween Party. He remembered last year with excitement. Thanks for the memories! Oh, Natasha would love making this cake! I wish I could have hosted another party for this year…alas, my ongoing neck and arm issues are limiting my options. Can’t wait to see your kids drop by trick or treating tonight! I know I say this a lot, but you are seriously such an amazing mom!! Halloween must be a blast at your house! 🙂 That Zebra cake looks fabulous!! You are too kind! Even though the boys will not be heading out for trick or treating…Hallowe’en itself can still be lots of fun. 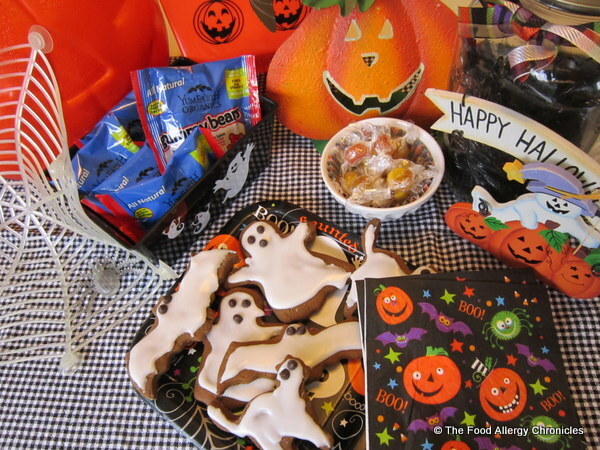 Andy will get the spooky music playing outside, the boys will have some allergy friendly candy, cookies and cake to snack on, and we will head out to visit ‘Haunts’ that have been set up at two of our neighbours houses…happy haunting!